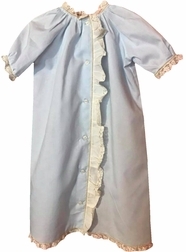 This is our darling new day gown or long Christening gown for baby boys or girls. It is made in your choice of color batiste fabric with a pretty gathered neck trimmed in French lace and sleeves that are also trimmed in lace. The gown buttons down the front and has a sweet ruffle trimming the button placard. 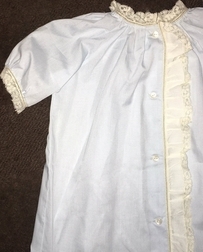 The button placard ruffle is also trimmed in French lace. 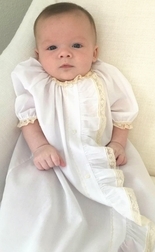 Makes a wonderful take home gown for baby, new baby gift or baby shower gift, AND, is just lovely for Baptisms and Christenings.